It’s been a week since my last post. It’s been hard not to write – I’ve cooked a bunch of stuff I want to tell you about – but I’ve been distracted. First, the kids are on spring break, so all free time goes out the window. Or I should say, it would have gone out the window if my mom weren’t visiting this week. 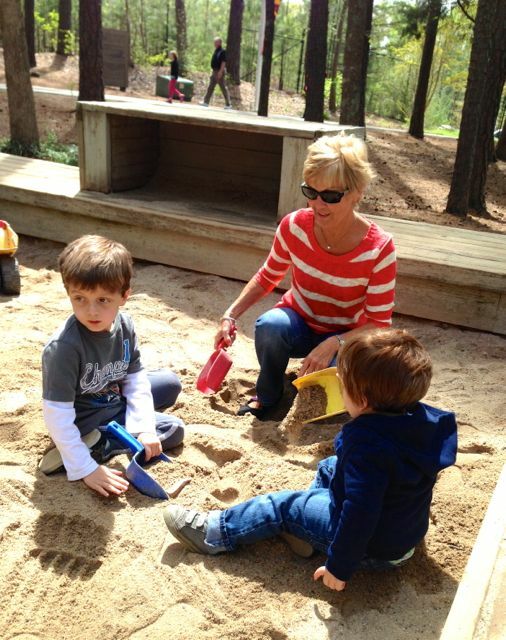 She’s great with the kids, and because of that all of my free time has gone to me doing things I don’t normally get to do during the day while my mom hangs out with them. Tonight, I’m vowing to get a post written. I’m sitting one room over from my mom, who is simultaneously watching Parenthood, playing Words With Friends (I know this because her alerts are set to a volume level that can best be described as “insistent”) and reading her Facebook feed to me. Anyway, it’s been a good week. 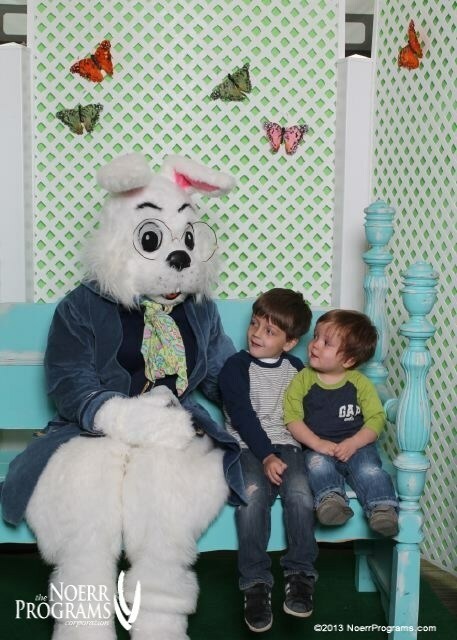 We’ve spent Rory’s waking hours doing fun things: Visiting the Easter bunny! Getting frozen yogurt! Going to the museum! And I’ve spent his napping hours taking advantage of built-in childcare with things that are fun for me: Cooking! Going to the gym! Going shopping! The Easter Bunny was ten minutes late showing up. They said he was “in the bathroom,” but it felt suspiciously like the spring sequel to Bad Santa. For this afternoon’s outing, I went to the Habitat for Humanity Restore (I’m looking for a table for our porch) and Kohl’s. Let me be clear: I probably wouldn’t have been allowed to come home if I hadn’t gone to Kohl’s. Because I had a 30. I’ll pause here to explain to the uninitiated what it means to “have a 30”. People with a Kohl’s credit card are sent coupons several times a year for either 15%, 20% or 30% off anything in the store for an upcoming week. 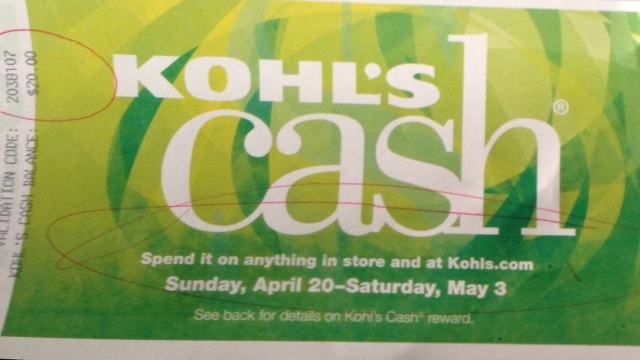 During those promotion periods, you also earn $10 of “Kohl’s Cash” for every $50 you spend. When I told my mom “I have a 30,” she practically pushed me out the door. You don’t get a 30% off coupon that often. And this is the woman who just this morning told me she had “free money” from Macy’s; in our family “having a 30” is basically the equivalent of the Publisher’s Clearing House people showing up on your doorstep with a giant check for you to use on anything your little heart desires that can be found at your local Kohl’s department store. Anyway, we’d load up the cart with underwear and socks, earrings and necklaces, the occasional cardigan or cookie sheet. She’d put it on her credit card so we could get the discount, and I’d give her cash or write a check for the stuff I got. For years, my mom encouraged me to get a Kohl’s credit card so I could get these discounts. “You don’t even have to carry it with you,” she’d tell me. “You can just use your driver’s license and your social.” (Social security number, that is.) For years I said no. And then, sometime in the last several years, I caved. So, back to today. I had patiently waited out months of 15s and 20s, and had finally received my 30. I must have been in Kohl’s for over an hour. I piled my arms with workout pants and tops, then moved to women’s clothes before hitting the dressing room. 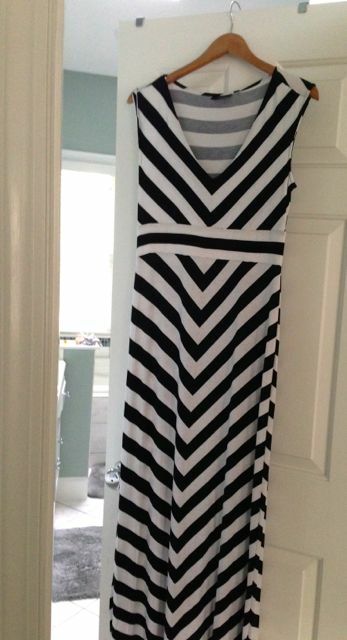 I ended up getting a new sports bra and what – in the harsh light but slimming mirrors of the dressing room – seems to be the perfect maxi dress. Bra strap coverage? Check. Not so long that it drags on the floor? Check? Slimming pattern to disguise the shar-pei belly? Check. Then I moved on to the lingerie department. While Gap still has my favorite underwear, Kohl’s is a great go-to for bras. Not because they had a BOGO deal going – even with my 30, that’s more than I’m willing to pay – but because I can always find something decent on their clearance rack. Or, more specifically, if I can’t find a good bra on their clearance rack, I don’t need one. I found a couple decent ones today – a racerback model that seemed like it would be practical for something, a polka dotted full coverage “T-shirt” bra, a push-up bra that created amazing cleavage but nearly had me laughing out loud at the pointlessness of it – what in God’s name would I do with cleavage? – but I didn’t buy any of them. I ended up walking out with the dress, the sports bra, some T-shirts, pajamas and socks for Noah (that kid had a growth spurt that is going to mean a lot of new clothes this year), a book for Rory’s birthday, a kite (I thought this would be for Rory’s birthday, but when I showed Pat he looked at me like I was crazy and said “Maybe for the beach. There’s never enough wind around here.”), a set of plastic pirate-themed kids’ tumblers and a set of salt and pepper shakers (these were for the benefit of my mom, who can’t- and rightfully so – get over the fact that when food requires seasoning, I carry the entire box of kosher salt to the dining table). I just realized that at the start of that previous paragraph I said I “walked out,” but obviously, you know, I paid. I waited in the line of a very enthusiastic cashier, who was eagerly explaining the Kohl’s Rewards program to the woman in front of me. I set my basket on the counter and watched the prices appear on the register as she rang up my purchases. Finally the moment came. I brandished my coupon. “I have a 30,” I told her proudly, making deliberate eye contact. Sometimes this will generate an “Oooh,” from a cashier, so I was disappointed with her relatively understated reaction. “Alright, alright,” she said, nodding. I then produced a second coupon, $10 off a children’s clothing purchase of $30 or more. “Does this still work?” I asked her. She swiped it. “Well, it took money off, so I guess so,” she said. Finally, I pulled out not one but two Kohl’s Rewards cards. “For some reason I have two of these,” I told her. “I can look that up,” she said. “What’s your phone number?” I rattled off my phone number while peeking at the customers in the line behind me, which was now three people deep. No one looked particularly annoyed. I suppose they were used to this. She determined my correct Rewards number, and tallied what I owed. “That will be $107.43,” she said. I handed her my driver’s license and gestured to the key pad. “I’m going to use my social,” I told her. She nodded. When I was done, she handed me my receipt. All that, and $20 Kohl’s Cash to boot. I can start spending it on Sunday. Maybe I’ll go pick up a few more kites.